I bought a plasma tv recently. This may not seem like a big deal for most of you, but I have been thinking about buying a flat screen tv for over a decade. 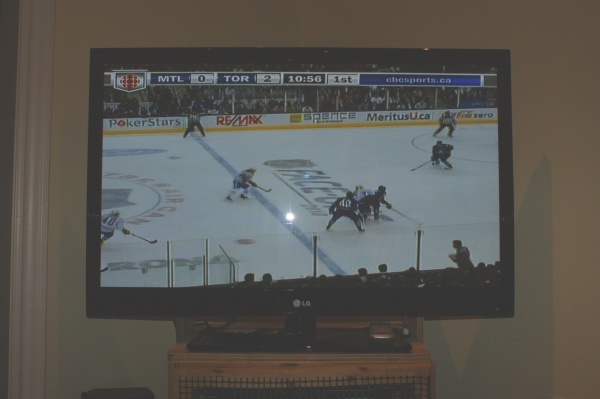 In 2000, I couldn’t decide what kind of flat screen to buy and I ended up buying a 27″ tube tv instead – it was awesome. The tv it replaced was older than I was, had no remote and the channel changer was broken, so I had to use pliers to change the channels. I finally replaced it when I couldn’t see the score during football games. The 27″ tv was still ok, but the colour and screen were fading. When I saw a 42″ plasma for sale at Best Buy for $550 a month ago, I knew my time had come. $650 with tax! It was so cheap, it would have been financially irresponsible not to buy this tv. The funniest post of the week was written by Financial Uproar – a very entertaining blogger who has never heard the term “politically correct”. His article on the five hottest women on business tv is just plain funny. Read it even if you don’t want to look at the pictures. Oblivious Investor says that index funds are mediocre. Luckily “mediocre” is the new black. Adam Goodman from Moneyville.ca explains how to save $7,000 without pain. Million Dollar Journey had a guest post how much does a year of happiness cost? Good post and great comments. Free From Broke writes about his daughter’s allowance. Canadian Capitalist warns that new financial products can have a short shelf life. He’s referring to high interest saving accounts. Rob Carrick has some great advice for DIY investors. Get that cash invested! Michael James tells us how to negotiate a line of credit. I think the only way to get a better rate is to move to another bank. Studenomics asks if student debt is good debt. International Bond ETFs: Should You Own Them? It’s Time for a “Virtual” Reality Check Are advances in technology really a good thing? Jason provides nine arguments against modern conveniences. FREE 2011 Calendar and Day Planner Download. Check out the cool FREE goal setting and planning calendar designed by Ron at The Wisdom Journal (pdf format). Which Debt to Pay Down First? – When trying to pay off debt, it can be difficult at first to know where to start. This article will help you decide where to start first based on your circumstances. How Much Of a House Payment Can You REALLY Afford? – How much better off financially would our society be if we lived within our means? Buying a house in your price range is no exception. 25 Christmas Gift Ideas Under $50. A few fund and inexpensive holiday gift ideas. I took the leap to a flat-screen TV a few years ago. I’m sure I couldn’t go back to a fuzzy-screen TV. Thanks for the mention. The laziness factor may prevent me from going to another bank. I knew I’d forget somebody’s book for the Christmas List. I updated it to include yours. I had a 12″ black and white TV (purchased for $100) for the longest time. Then my wife got a $350 TV from Wal Mart and finally a flat screen earlier this year. I might still be with the $100 set if not for wife and family. I went to Walmart to buy a flat screen on Boxing day! Related to the t.v. topic is cable. There is an underlying movement amongst folks who think cable is to expensive. They’re cutting their cable and replacing it with free HD channels emitted from the CN Tower. I don’t recommend this for the avid t.v. watcher aka couch potato, but really good for those who don’t want to spend their lives in front of the tube. After watching sports in HD, you just can’t go back! It’s amazing how much flat screens have fallen in price even over the past 1 year. Thanks for the mention! I know no sense watching on a 27″ tv sports! Thanks for the mention Mike, but I’m a little disappointed you didn’t vote for your favorite! We’re waiting for our tube tv to finally go. Soon, soon. @Uproar – I couldn’t make up my mind. @Craig – try throwing stuff at it. Looks like you got a LG plasma – the same as we have. We bought a 50″ LG plasma last year for $550 at sears after coupon and 2 rebates. Gotta love a deal! Hey Pete – wow, sounds like you got a great deal. It continues to amaze me how much prices drop over time.